The Sierra Madre Tattler! : Pasadena: Low Information Voter Capital Of California? Pasadena: Low Information Voter Capital Of California? 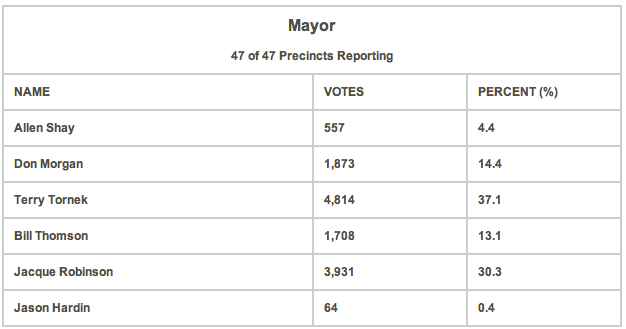 I'm not sure why it is a city such as Pasadena can hold an election for Mayor and only get a turnout of less than, well, OK. Let's figure that out. No news source in the area has done it yet, so this is on us. Pasadena has a population of approximately 140,000. I rounded that off. According to Wikipedia 58.2% of those living there are registered to vote. Right around 81,200 people. So how many actually voted? If you look at the chart below containing the results for the Mayor's race in Pasadena, and add up the vote count of all the candidates, you can see that a total of 12,977 ballots were cast. Meaning that only 16% of those eligible turned out to vote in this election, an abysmally low figure by anyone's standards. So maybe we can say that out of the 58.2% registered to vote, the vast majority are No Information voters? Probably. Although I do hope I'm not going to be seen as being too critical because that would be unfortunate. In the Eloi-like nether world of LIV Pasadena, civility must be maintained all the way into the cave and right up onto the dinner table. Now there are two individuals running for Mayor this year that contentedly served on the Pasadena City Council for a healthy portion of the years Danny Wooten was robbing the Home of the Dome blind. And as we know, nobody on that City Council was quite alert enough to figure this out. We are talking about an 11 year period during which $6.4 million dollars was stolen right out from under the slightly aloft noses of Pasadena's not very vigilant voter elected elite. The two there having the actual brass to run for Mayor being Terry Tornek and Jacque Robinson. Both of whom, fearing a possible negative political reaction, pointed their boniest fingers at the City Manager and appeared to demand his head on a plate. But only in the most metaphorical of senses since Michael Beck still has his gig and his head, and will probably keep both long after one of the two actual guilty parties is elected. And why not? The Beckster dutifully took the blame for things that were actually their fault. Which I assume is expected behavior for Pasadena City Hall employees. Kind of like the Shmoos (link) in Al Capp's comic strip series Lil' Abner. Consistently taking the fall for the sad failures of a Mayor and City Council being the kind of service only the most aggressively obeisant can successfully pull off. Just like any Royal Family, Pasadena's elected officials have their personal whipping boys and girls. Which, to the rest of us, are known as city staff. Some might believe that the voters of a city that had just experienced a huge embezzlement scandal, and over so long period of time, might have questions about the ability of their elected leaders to keep an eye on things. And that a serious "throw the bums out" movement could have arisen from those unforgiving, fast food forward streets. But since this is Pasadena, you would be wrong. Out of the mere 12,977 votes cast, the two Councilmembers that snoozed their way through a considerable chunk of that 11 year embezzlement spate received 8,745 out of the 12,977 votes for Mayor. Or close to 68% of the total. Meaning the Low Information Voters of Pasadena (that is, the relative few of them who actually bothered to vote) bought into the inane argument that their elected officials have no real responsibility for maintaining the financial security of a city government with a total yearly budget of nearly a quarter of a billion dollars. Apparently they are only there for decorative and entertainment purposes. Which they also fail at. Now you might also believe that things would need to change at the Pasadena Unified School District as well. 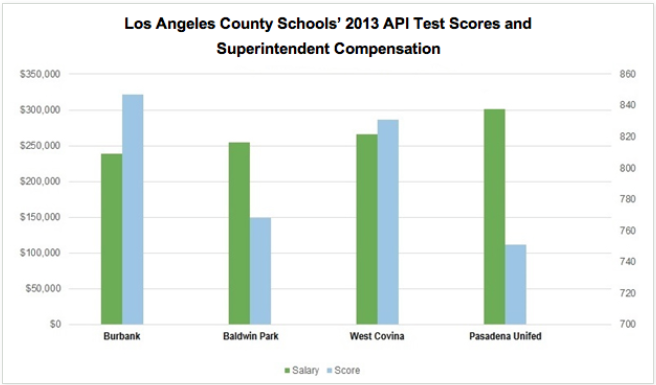 As you can see by viewing the chart I have provided above, the API scores of the PUSD do not stack up well against the similarly sized school districts selected for this graphic. As a matter of fact, they don't smell very good, either. The PUSD is considered to be one of the weakest school districts in our portion of the state, with large percentages of the families that could attend opting instead for expensive private school educations, or even moving completely out of the area. And there is quite an exodus going on, much of it driven by a desire for decent public education opportunities, buttressed by inflated real estate prices. Many are finding escape is now possible. As such the PUSD is obviously in need of some new and energetic leadership because, let's face it, the place is at best an at-risk school system. Even with fruits and vegetables class included. So did the voters get out the broom and sweep in a whole new group of people with an independent outlook and a desire to try some new and exciting things? Of course not. Rather they elected three affable though dull fellows with the full endorsement of the same failed establishment responsible for the Pasadena Unified School District's problems in the first place. Gents who each actually signed legal forms pledging their allegiance to certain special interests. Interests that then financed their campaigns to the tune of many thousands of dollars. All strings attached. It must have been the pretty postcards special interest money bought for them that won it. Because none of the three had much to offer. Certainly nothing that gave any realistic hope to parents looking for a change for the better. Just the usual toys in the attic stuff that only true low information voters ever would believe. What makes this even more perplexing is these are the same three Board of Ed districts robbed of their vote for two years by a politically driven racial gerrymandering scheme. This coming from the same bogus establishment responsible for both those atrocious API scores and the compromised candidates Pasadena's LIV just elected. 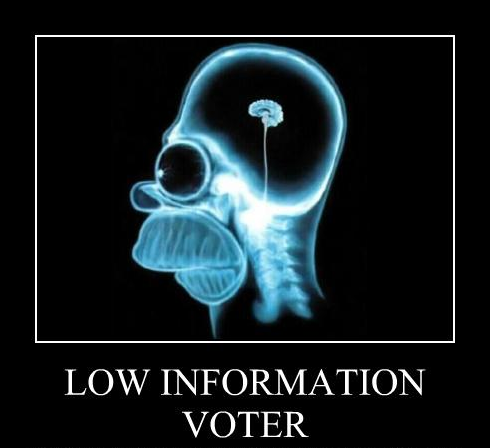 Of course, since so few Low Information Voters actually do vote, why would they ever care? It's not really their thing, anyway. The relative handful of participating Low Information Voters of Pasadena selected two City Councilmembers who will now compete next month in a final round for Mayor. Two individuals who failed to detect, and in any possible way, a $6.4 million dollar decade long embezzlement scandal. Something seen as indicative of the overall malaise and lack of effective leadership there. The LIVs also voted in the three hand-picked candidates of the same unscrupulous and failed education establishment that put the Pasadena Unified School District into the dire straits it is today. A district that many believe will see a Sacramento takeover within the next several years. Expect a lot of Shmoo blaming. Pasadena is one of those cities that has removed a lot of parking space and now expects you to take the bus to shop there. Can't wait until Pasadena passes a $15 minimum wage and restaurants start closing. How much does $15/hr minimum wage X 0 hours (since the business closed) come out to in a week? I avoid shopping in Pasadena. Arcadia lets you have free bags. It is the "King's New Clothing" of a town. No industry, no parking, no $15 dollar an hour jobs, nobody watching the shop. Still not a pretty sight, however. What is a "beta male"? In Torres' case, someone who will vote pro-Union EVERY time. A beta male is a fellow comfortable with doing as he is told and deferring to the wishes of others. An unremarkable, careful man who avoids risk and confrontation. Beta males lack the physical presence, charisma and confidence of the Alpha male. "Pete knew he was losing the girl he'd just met at the bar to the guy who bought her a drink, but he was too much of a beta male to do anythigng about it." Yes as your candidate lost the electorate must be uninformed. Obviously. School board members with DUI convictions are all the rage these days. No not uninformed, but given very biased information by union lackeys which made them believe teachers would get huge raises. This of course will make them better teachers. 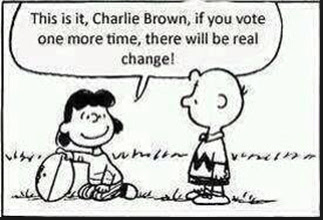 Many people vote against their own interests. It doesn't make them bad people, just dumb. Did anyone go to the Mira Monte open house yesterday? Someone sent me a really good report of their experiences there. I will be posting it either tomorrow or Wednesday.